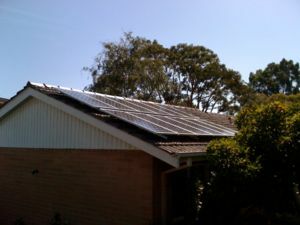 The Doncaster house has a 2.1 kW solar array installed in January 2011. To date since the system was turned on (after inspection), approximately 5.5 days has been 62kWh. This has included some overcast days and some 30deg+ days (when efficiency drops). When the inverter is upgraded to the SB4000TL the output should increase due to higher inverter efficiency(~97% vs SB1700 ~92%). I'm also hoping to be able to collect more detailed data via the Bluetooth interface. On current numbers my household uses approximately 10-12kWh a day on average, so I am currently on par with my usage. This level of sustainability was my goal. From a financial aspect, I am would be in net credit when accounting for the Victorian Feed in Tariff. I won't know the details until my bi directional meter is installed. I'm estimating payback to be approximately 3-4 years (I was lucky to receive the $8000 federal rebate). As soon as panel prices approach the $1-2 per Watt I'll be adding another 1-2kW. Hopefully in-line with generally available plug in electric cars. This page was last modified 09:57, 24 February 2010.